AUSTIN – The Texas Department of Public Safety (DPS) is asking for the public’s help in solving the disappearance of Rena Rincones, and an increased reward of up to $6,000 is being offered for information that leads to the arrest of those responsible if the tip is received before next month’s featured Texas Rangers cold case is announced. A $3,000 reward for information leading to an arrest is routinely offered on all matters on the Texas Rangers’ Unsolved Homicides website. Rincones was reported missing to law enforcement in March 1995. 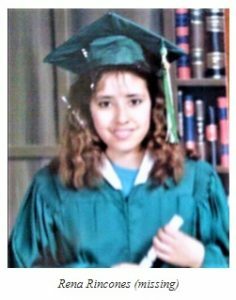 According to her father, she was last seen leaving her parents’ residence in Falfurrias, Brooks County, on June 21, 1994, and she was never heard from again. It is believed Rincones was going to a house in the Premont area in neighboring Jim Wells County. At the time of her disappearance, Rincones was married and had a one-year-old daughter. Law enforcement presumes Rincones is deceased, and her body has not been recovered. Rincones remains missing, and the case remains unsolved despite the efforts of law enforcement authorities. The DPS Texas Rangers’ Unsolved Homicides website provides information on more than 75 cases to help garner public interest in unsolved or “cold cases.” Texas Crime Stoppers offers rewards (funded by the Governor’s Criminal Justice Division and administered by DPS) of up to $3,000 for information that leads to the arrest of those responsible for any Rangers cold case listed on the website. For more information, visit the Texas Ranger cold case website. As part of a DPS public awareness program, one case from the Texas Ranger’s Unsolved Crimes Investigation (Cold Case) Program is featured each month to generate new investigative leads and bring attention to these cold cases. The Texas Crime Stoppers reward is increased up to $6,000 for the featured instance in hopes that the higher reward money will generate additional tips. The higher reward amount will only be paid if the tip is submitted before the next case is featured. The Texas Ranger Unsolved Crimes Investigation Program was created to assist Texas law enforcement agencies investigating unsolved murders or violent serial crimes. Since there is no statute of limitations for the offense of manslaughter, investigators pursue these cases to a successful resolution or until no viable leads remain.